LeChiffre ransomware uses sophisticated techniques to infiltrate computers and hide from its victims. Use Reimage to determine whether your system is infected and prevent the loss of your files. How to remove LeChiffre malware and restore the files? LeChiffre virus was spotted last year. Security experts managed to find a decryption tool for it. It did not take too long for the authors to devise a newer version. Continuing the popular trend, the virus was named after the name of the villain called “LeChiffre,” meaning “the Cypher”, featured in the first James Bond movie. The latter franchise inspired many cyber criminals. Another similar threat happens to be notorious Petya virus now switched to GoldenEye. Besides the title, the virus also uses an elaborate algorithm. If this virus manages to enter victim’s system, it finds all user’s personal files (including documents, music, videos, audio files and so on) and encrypts them using AES algorithm. The encryption is made by encrypting the first and last 8192 bytes of the file and then attaching the malicious key to the file as a 32-byte blob. Once encrypted, the files become inaccessible. However, there is no need to give into the distress. The first thing you need to do is to remove LeChiffre. If you see this note, it is a proof that LeChiffre ransomware has attacked your computer. We do not recommend paying the ransom. You cannot trust cyber criminals – there’s no guarantee that they will put any efforts to help you get the files back. Plus, a decryptor for this ransomware has been created already (unfortunately, works only on LeChiffre 2.6 version only, but may be upgraded in the future). However, you can also restore your files in case you have backup copies of them. If you have such copies of your files, all you need to do is to remove the LeChiffre ransomware from your computer using LeChiffre removal tool (for example, Reimage, and then import your files from a backup drive. Keep in mind that you should store backups on an EXTERNAL backup drive, because some viruses can reach your online data cloud storages and infect files that are stored there, too. The ransomware justifies its name "LeChiffre" as it is almost impossible to decrypt the files without the decryption key. Since the appearance in mid-summer last year, the authors have not departed the ransomware market. Unfortunately, the virus has been continuously developed. Small business with a wider network of servers happens to be the preference of LeChiffre malware. Specifically, the virus launches brute force to paralyze the activities of the server and infect all linked computers. Furthermore, the virus marks the corrupted data with .lechiffre file extension. It has been also known that newer version of the virtual threat utilizes a password-guessing technique. In other words, if you have been using a standard and a weak code such as “password123″, the cyber villains easily hack into the server remotely and then download the main payload of the ransomware. Therefore, netizens are advised to use long passwords comprised of characters and numbers. Password managers may also be a solution. Security experts claim that LeChiffre ransomware is not a typical ransomware, and in most of the cases it is spread through different channels. The virus should not be underestimated. A while ago, LeChiffre cyber-criminal planted this virus on a computer of a bank in India and spread the virus to the following computers via Remote Desktop Ports that did not have password protection. Crooks prefer disguising their threats in spam emails. Users are deceived with the fake notifications supposedly sent from delivery companies or even law enforcement institutions. In addition, exploit kits and trojans also serve for the purpose of spreading infection. Though LeChiffre hijack might have occurred due a different method, it is necessary to renew arm up with several security tools. Let’s not forget the fact that cyber-criminals learn and improve their products each day. 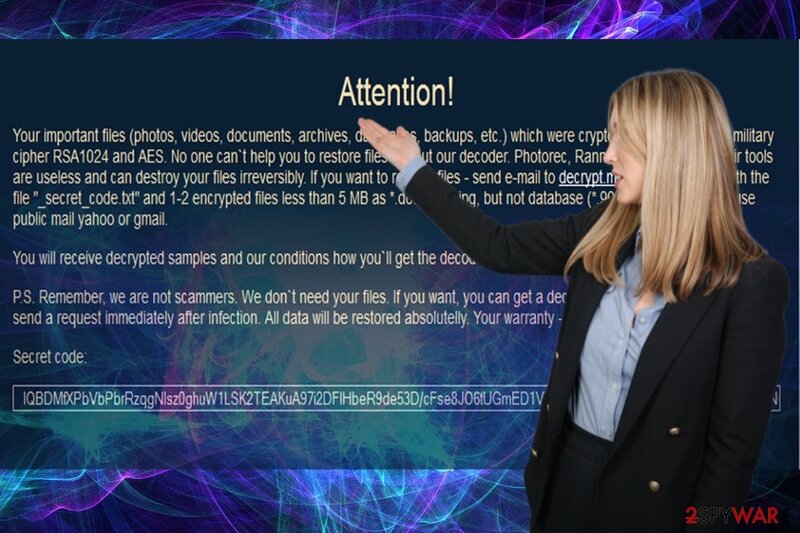 Avoid opening emails from unknown senders (ransomware is commonly spread via malicious email attachments), clicking on links on high-risk websites, or installing unreliable software. According to the note of .lechiffre file extension virus, you can get your files back for free after 6 months. This is unlikely to happen. There is no guarantee that the crooks will return the undamaged or all files after this period. Do not waste time and initiate automatic LeChiffre removal. Install and update your security applications, e.g. Reimage or Plumbytes Anti-MalwareMalwarebytes Malwarebytes. Only when the full elimination is completed, you can proceed to file recovery steps. In case, you encounter any problems and cannot remove LeChiffre virus, the below instructions will help you regain access. A decryption tool has been released last year. It is unlikely that it will decode the files encrypted by the recent version, but you might give it a try. Log in to your infected account and start the browser. Download Reimage or other legitimate anti-spyware program. Update it before a full system scan and remove malicious files that belong to your ransomware and complete LeChiffre removal. If the above-suggested methods do not solve the problem, you might need to perform System recovery. When a new window shows up, click Next and select your restore point that is prior the infiltration of LeChiffre. After doing that, click Next. Once you restore your system to a previous date, download and scan your computer with Reimage and make sure that LeChiffre removal is performed successfully. Guide which is presented above is supposed to help you remove LeChiffre from your computer. To recover your encrypted files, we recommend using a detailed guide prepared by 2-spyware.com security experts. If you did not have the back-up copies, this program, which locates missing and damaged files, might help you find the solution. The key advantage of the software is that it may recover the files according to the patterns of shadow volume copies. They are automatically created by every operating system. This free decrypter has been released last year. It might hardly decrypt the files affected by the recent version, but you may give it a try. ^ GoldenEye ransomware targets HR departments, disguised as a job application. Alphr. A fresh take on technology. ^ Cassius Puodzius . How encryption molded crypto-ransomware. WeLiveSecurity.News, views, and insight from the ESET security community. ^ Carl Straumsheim. Your Data or Your Money. Inside Higher ED. Higher Education News, Career Advice, Jobs . ^ Eric Geier . How to back up your computer and files. My Dayton Daily News. Dayton in-depth, Investigative News. ^ Rob Price. The world's most popular password is depressingly easy to guess. Business Insider. Business and Tech News. Kaip apsiginti nuo LeChiffre viruso? This entry was posted on 2017-01-30 at 00:34 and is filed under Ransomware, Viruses. You can quickly scan the QR code with your mobile device and have LeChiffre virus manual removal instructions right in your pocket. How did you remove LeChiffre virus?